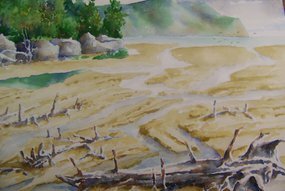 I am first and foremost a painter of watercolor landscapes. What I see and feel in the natural world makes sense. As an avid flyfisher, that inspiration often comes from the authentic and intimate experiences with fly rod in hand. First I sense the whole scene, then begin to focus on the pools and riffles...some moss here, gnarly roots there, changing light on the rocks and leaves. Hence I paint compositions which lead the viewer to experience the whole before examining the parts. Description: On the California Coast; believe I could fly between here and Acadia and spend the remainder of my life painting. 18 x 24 & 140 lb. paper. As a senior in high school, I read Ted Kautzky's Ways With Watercolor and was hooked for life. The book was full of vivid transparent watercolors and common sense advice for the aspiring artist. After graduating college with a degree in education, I became an art teacher in the Maryland public school system. During summers I worked as a coordinator and director in the state's Gifted and Talented Summer Centers. Eventually I became Supervisor of Fine Arts for Washington County Maryland. Throughout my career, I continued to paint with watercolors and attended workshops presented by John Pike, Dong Kingman and many others. I currently live in Sharpsburg, Maryland with my lovely wife Cindy. I find daily inspiration for my art through a love of the outdoors. Now in retirement I have more time to focus on my painting and the sketchbook can “go out the door” and the studio lights can “go on” daily.